The answer to last week’s challenge is. Q: During a medical examination, Jerry’s blood pressure was found to be 3 x that of a normal healthy person. Yet, Jerry’s Doctor was not too concerned. Why not? A: Jerry is a Giraffe. 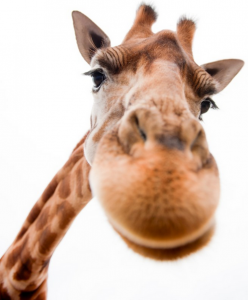 The average blood pressure of a giraffe is 3 x that of a human. The higher blood pressure is required to pump blood up the long neck to the brain. Q: Why did a famous statesman and world leader stand up in front of a large crowd and say, very seriously “I am a jam doughnut”? Beside proposing the giraffe as an answer to MF60 I also suggested that an astronaut accelerating at 3g or more during takeoff might be an answer; did you look into that? For MF61, the answer can be found easily by googling the question; president J.F. Kennedy when he tried to say in German that he was a Berliner at the Berlin wall in 1963. But I want to venture away from the historical incident by giving the following lateral thinking answer; it was a president who was accused by the media of being hard hearted and he wanted to tell his people that he was in reality soft and sweet like a jam doughnut. Wouldn’t this make the crowds’ mouths water over him?